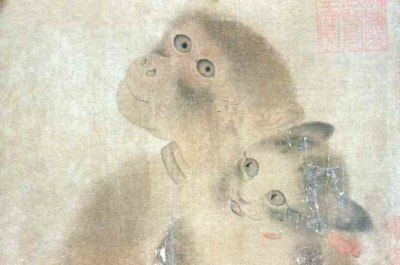 Perhaps his most famous work, Monkey and Cats is a charming representative painting by the Chinese artist Yi Yuanji (1000-1064). Yuanji lived during the Song Dynasty in China and wanting to make a name for himself in the art world realized that painting traditional subjects would not gain him the notoriety he craved. He realized that no one was recognized as “the gibbon artist” so the artist also known in the western world as Yüan-chi decided to make these curious animals his life’s work. In this painting on silk, we have a young gibbon playing with two kittens. One kitten appears to have gotten a bit too close and the playful monkey was able to grab the little cat. A second kitten strikes a defensive pose as the gibbon simply sits holding the first kitten and looking quite pleased with himself. Both cats and gibbons were kept as pets and you can see a leash on the gibbon as well as red ribbons around the necks of both kittens. The close-up picture to the right really shows the facial expressions on each of the animals. I found myself truly drawn to the eyes of the monkey and feel almost like he is looking at me and challenging me to take the kitten away from him, while maintaining a playful rather than aggressive appearance. To learn more about this famous artist who was born over 1,000 years ago, please visit our biography of Yi Yuanji.